Here’s another variation on the earlier example of displaying a spinning busy indicator using an Image control. This example shows how to do the same thing when the Image control is hosted in a DataTemplate. In the code below, the Image control is part of the data template. 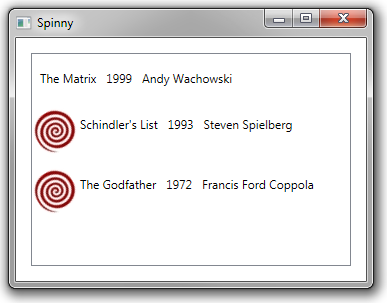 If the Movie object’s Loading flag is true, the image will be displayed and the Storyboard will animate (spin) it. Once Loading becomes false, the Image stops animating and disappears. <Image Name="imgBusy" Source="Images\spinny3.jpg" Height="40" Width="40"